This guide will help you learn the basics of Todoist and get started with a simple task management system to stay organized and on top of everything you need to do. It turns out, our brains are actually wired to keep us thinking about our unfinished tasks. Handy when you have one thing you need to work on. Not so good when you have 30+ tasks vying for your attention at once. That’s why the first step to organizing your work and life is getting everything out of your head and onto your to-do list. From there you can begin to organize and prioritize so you know exactly what to focus on and when. To add a new task to Todoist, just click + or use the keyboard shortcut Q to open the add task window, type in your task name, and press Enter. We also recommend downloading our apps for macOS, Windows, iOS, Android, and more so you can jot down tasks in Todoist the moment they come to you, no matter where you are. If you know you need to have the task done on a certain day, type in a due date and/or time along with your task name. Todoist will automatically recognize and add the due date so you can create tasks quickly, especially on our mobile apps. If you ever want a highlighted word or phrase to become part of the task name instead of the date, just click on it to un-highlight it. You can also add recurring due dates to your tasks like every first of the month, every 2 weeks starting June 1, or every Monday. When you complete a recurring task, the due date will automatically reset so you won’t forget the next time you need to do it. Perfect for remembering everything from paying the rent to submitting quarterly reports. Try to make your tasks concrete and manageable – things you could accomplish in an hour or less. “Start my own widget company” is overwhelming, vague, and easy to put off for later. “Brainstorm a list of 25 possible company ideas” or “Call Judy to get a recommendation for a small business lawyer” are easier next steps that don’t need extra decision-making to get started. You can add those smaller steps as sub-tasks under a “parent” task. Just drag and drop a task to the right under a parent task to make it a sub-task. Something went wrong while trying to load the video in the browser. Please download it so you can watch it. 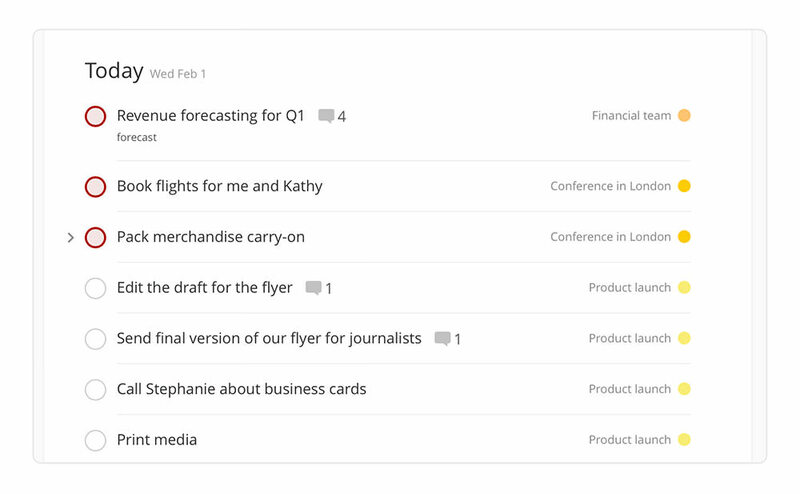 Projects help you organize your tasks into separate lists. Your Todoist comes with a list of standard projects to get you started, but you can create, delete, re-name, re-arrange, and color-code your projects any way you like. If you’re a teacher, you could create a project for planning each class you teach. If you’re a software developer on an agile development team, you could create a new project to keep track of each sprint you work on. If you work in marketing, you could create a project for each new campaign you plan to launch. To create a new project, click Add Project at the bottom of your project list, type in your project’s name, choose a color to make it stand out, and press Enter. To start out, try keeping your project list as simple as possible. That makes it easier to decide which tasks belong where, and helps you focus your time and energy on a small number of important projects at a time. You can always add more projects later. For each new project you create, ask yourself what next steps need to be done to move it forward. Don’t worry about getting everything down right away, you can always come back and add steps as they come up. Add each step you think of as a new task in your project. To get started, identify the first concrete step you’ll need to take to move that project forward. Drag and drop it to the top of that project’s task list. You can quickly add a task to a specific project by typing # into the task name field. 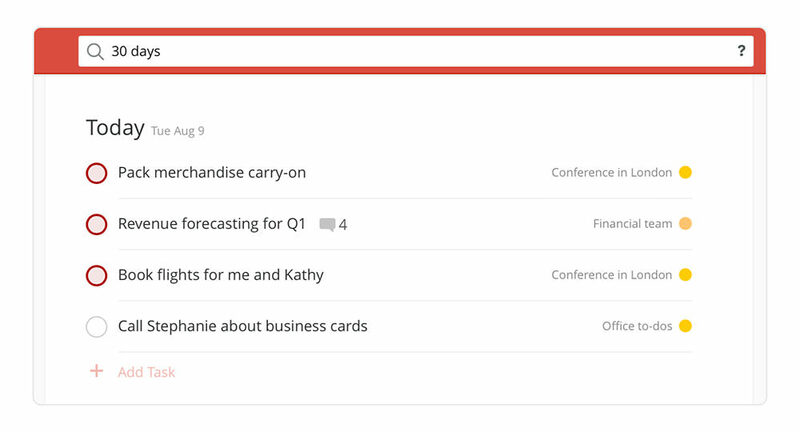 Todoist will automatically pull up a list of all your projects and narrow down the results as you continue to type in your project name. This shortcut is especially handy for quickly adding tasks on your mobile device. Not sure where to organize a new task? Add it to your Inbox first and decide later. Your Inbox acts as a default list for tasks that don’t have a project yet, or tasks that aren’t attached to any particular project. When you’re ready, just drag and drop these tasks into the right project in your list. Now that you have a concrete, manageable plan for tackling your projects and goals, let’s take a look at how you can turn your big-picture plans into an organized daily to-do list. Just listing out and organizing your tasks can be a huge relief when you’re feeling overwhelmed. But the true power of Todoist lies in helping you plan how you spend each day to make sure you’re making progress on what’s important to you. Your Today and Next 7 Days views let you see all of the tasks across all of your projects that are due today or in the next 7 days. This is where you’ll spend most of your time in Todoist. Your Next 7 Days view makes it easy to plan your week ahead of time. Many people block off half an hour on Sunday or Monday morning to get a big-picture overview of the week to come and decide what they need to accomplish each day. Your Today view makes it easy to stay focused on the right things on a daily basis. Throughout the day, you can always check your Today list for your next upcoming task. 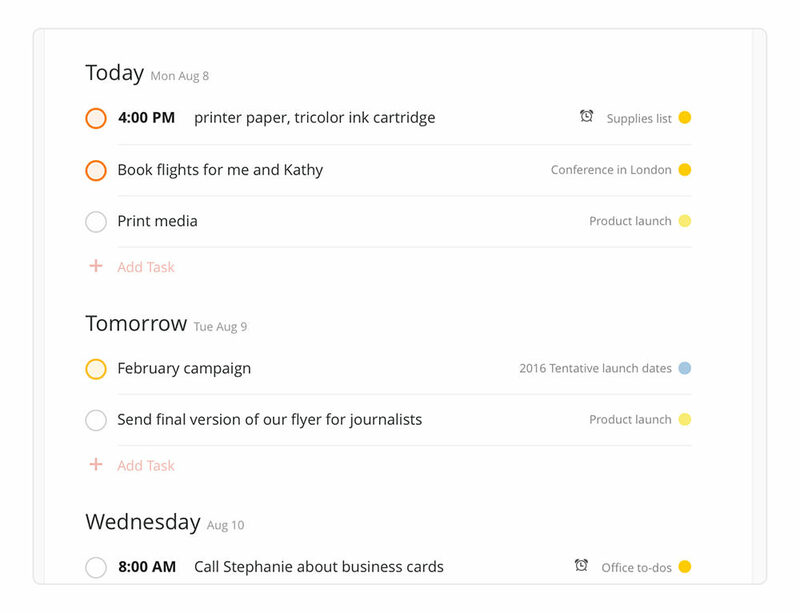 You can even print your daily to-do list and keep it on your desk for easy reference. You can view and plan your tasks farther into the future too. Just type the number of days you want to view – for example 30 days – into the Quick Find search bar at the top of your Todoist. Most people find it hard to maintain a to-do list because they overestimate how much they can accomplish in a day and fail to prioritize their tasks. At the start of each day, ask yourself: What do I need to get done to feel satisfied with what I’ve accomplished at the end of the day? Identify no more than 3 important tasks for the day, give them a due date for today if they aren’t already scheduled, and mark them with a red Priority 1 flag. That will keep them at the top of your Today list. Now that you know the 3 things you must accomplish today, it’s time to actually do them. Study after study has shown that our willpower is highest in the morning, before dozens of other decisions have eaten away at our mental energy. That’s why it’s important to work on your Most Important Tasks first. Accomplishing your hardest tasks first helps build momentum for the rest of the day. And even if you get interrupted with calls, meetings, or emails later on, you’ll have already made progress on your most important work. Luckily, if you’ve been following this guide so far, these tasks will already be organized at the top of your to-do list for each day. Just open your Todoist to the Today view first thing in the morning and start working on your first important task. You won’t always complete all of the tasks you hoped to get done each day, and that’s ok! It’s human nature to underestimate how long things will take. That’s why Todoist makes it easy to be flexible and adjust your plans as you go. At the end of every day, you can use the Next 7 Days view to review and cross off everything that you’ve accomplished, and evaluate what you need to re-schedule for tomorrow or later in the week. 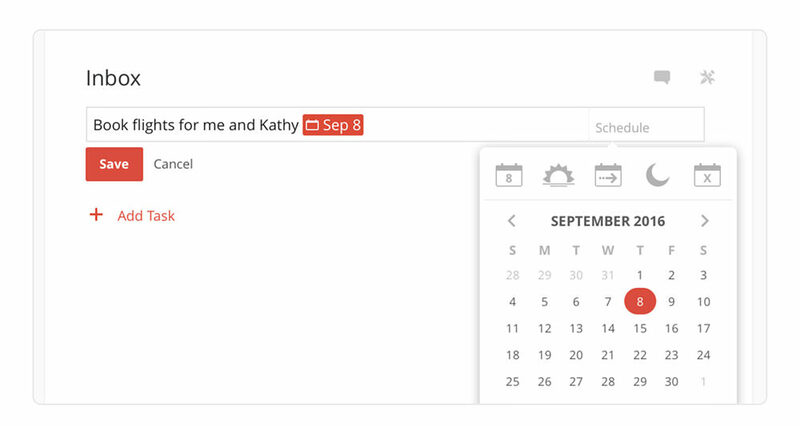 Simply drag and drop any remaining tasks left from today to tomorrow or later in the week. You can always view a list of your completed tasks by clicking on the gray clock icon at the bottom of any project’s task list. If you completed a task by accident, you can uncomplete it by clicking on the checkmark. Now that you know the basics of Todoist, you’re ready to start getting organized and taking control of work and life.